Submitted by steev on 12. May 2010 - 18:49. Arizona passed a law that outlaws ethnic studies courses and teachers with accents in secondary schools. Tucson students walked out, surrounded the TUSD admin building and got a meeting with the superintendent cancelled, then marched down to the state building where the sup was having a press conference. 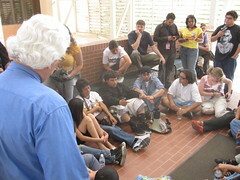 they did a sit in there until police arrested around 37, including a professor at U of Arizona. about 100 supporters gathered in the courtyard and outside.